"We loved the performance, adults and children alike. 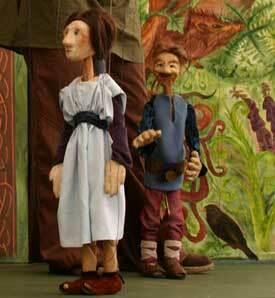 The music and puppets kept the children's attention throughout the 3 stories. Some of the children are only just 3, and it takes some skill to keep their attention for so long." "Excellent - I have never seen my class so involved and in awe! We thoroughly enjoyed it - brilliant experience. The music and voices were captivating and created a mythical aura. Thank you"
Join us on this captivating journey through the enchanted landscape of Welsh myth. Three tales from the Cambrian mountains have been woven together to produce this beautiful show. is designed to inspire and enthrall, young and old. We collaborated with Welsh folk group Canol and harpist Chris Knowles to create the evocative soundtrack. There is the tantalising option of having live musicians!